Most guitar pickups are created by wrapping copper wire around a magnet and measured by the "ohm" reading from that wire, which is supposed to be an indication of volume. However, there are copper / magnetic pickups on the market that register almost zero ohms and are still quite loud. Why is this? Whenever we buy guitar pickups, one of the first things we look at is the K-ohm (kilo-ohm) rating. The general belief is that the higher the K rating, the more "powerful" (louder) the pickup. And to an extent, that is true. It is at the same time a total misconception of how pickups work. Measuring pickups strictly by ohms is a "cheat figure" the guitar industry uses to make general power ratings easier to understand. The reality is that ohms have nothing to do with the actual power (volume) of a pickup. There is a good reason for this: ohms is not a measure of electric flow; is it a measure of electric impedence-- the resistance of the device to the flow of electricity. Why then are ohms used as a pickup rating? Because in general, ohms refer to how much copper is in the pickup coil. The widespread belief is that the more copper wire, the more volume. However, this belief is not correct. Yes, all things equal-- given the same coil shape and the same wire thickness and consistency-- the higher the ohm rating the more powerful the pickup. Mellow guitar pickups often have ohm ratings between 4.5K and 6K. Humbuckers often run 7K to 9K+. "Hot" pickups (ie heavy metal) sometimes hit 16K or more. But the reality is this: a lot more is involved in making a guitar pickup than wrapping a wire a certain number of times around a magnet (a typical guitar "coil"). There are many variables involved. That is why the field of guitar pickups is so complex and competitive, with everyone claiming to have a "special" pickup. Those variables are why pickups sound different from one another. If all that was involved was wrapping wire a specific number of times around a magnet... all pickups would sound the same, the only difference being the number of wraps involved. IS THE OHM / POWER RATING ACCURATE? In a word, no. This is proved if you wind thousands of hair-thin wire coils around a piece of cardboard and then take an ohm reading on those coils. You will get the same ohm reading as if you wrapped them around a magnet, no difference. Ohms is a measurement of the wire's resistance to the flow of electricity. So how can ohms possibly rate power and volume? There are many variables in designing pickups. Yes, if you're sporting a 17Kohm pickup you are likely to get some serious power and probably a lot of natural distortion in the process. If you buy a 4.5K pickup it's almost certainly intended for clean, mellow blues and smooth jazz. But as you've read here, it's just a generalization. The best way to judge pickup sound and power is by ear. It is because of these things that I built almost 200 FlatCats before I settled on the final design that produces its uniquely awesome sound and volume. The result: solid 5-star reviews lauding its rich and vibrant output. FlatCats are very thin and measure at slightly under 5 ohms. How then, does a FlatCat produce its amazing volume and unusually rich and robust sound? With most guitar pickups, the majority of the pickup sits inside the body, about an inch underneath the strings. This is where the magnets are located and where the coils are located. The magnetic field is usually carried up through pins to the vacinity of the strings. That is why the magnets and coils have to be so large-- to carry that far. The FlatCat is different. The entire pickup sits directly under the strings. Nothing is stuck inside the guitar body or removed from the strings. 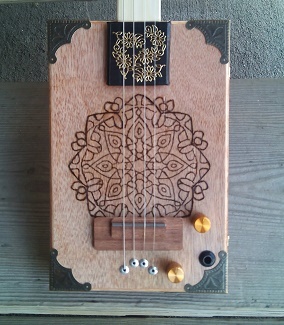 This allows the FlatCat to pick up every bit of energy, every nuance of sound from the strings. As a result, a FlatCat with a lower "ohm" rating produces as much "power" (volume and tone) as a full-size humbucker. In fact a FlatCat can pick up some sounds a standard humbucker may miss, simply due to proximity to the strings and the way the FlatCat is designed internally. The result is so unique, awesome and rich in tone that I use FlatCats on my personal guitars. My customers are amazed at the sound they get from this thin pickup. It's difficult to create a scientific measurement of "wonderful sound", because people's ears and tastes differ. What sounds good to one person will sound not so good to another. Subjective sound is why in guitar, amp and pickup reviews many will rave about a product while others will say they don't like it. That's why there are so many different kinds of guitars, pickups and amps on the market. Each offers a specific sound to appeal to different people. FlatCat™ Pickups are designed to appeal to a wide variety of guitar playing styles and listening preferences. Glowing customer reviews prove its popularity. Depending on your playing style, volume settings and the amp you use, FlatCat sound can range from smooth and mellow to "rock out". 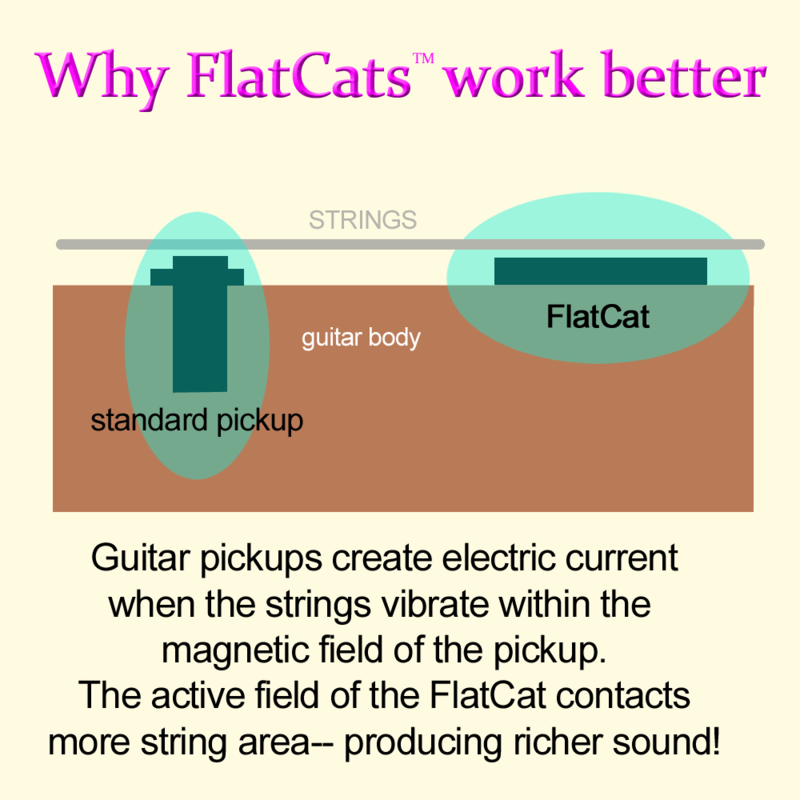 FlatCat is a very versatile pickup that is enjoyed by musicians world wide. True pickup power is measured not by ohms (impedance in an electrical line), but by resulting volume and rich sound. The FlatCat definitely produces the power and quality sound guitarists look for in a high-level pickup-- and does so at a very reasonable price.